The Intel-based San Diego smartphone, previously known as Santa Clara, will go on sale in the U.K. on June 6 via Orange, the operator said on Thursday. Today, ARM-based processors dominate among smartphones and tablets, but Intel is devoting a lot of resources to carving out a chunk of this growing market. The San Diego is powered by Intel's Atom Z2460 processor at 1.6 GHz. The phone also has a 4.03-inch screen with a 1024-by-600 pixel resolution and an 8-megapixel camera that will be able to take 10 images in one second, and shoot video at 1080p. More competition in the smartphone processor space is good for all involved, said Yves Maitre, vice president for Devices at Orange Group, when the phone was introduced at Mobile World Congress in February. Orange is a big supporter of HD Voice, which has been implemented on the San Diego. For now the phone runs Android 2.3, but an upgrade to Android 4.0 is on the way. Breaking into the smartphone market isn't going to be easy for Intel, according to Malik Saadi, principal analyst at Informa Telecoms & Media. "I think Intel is making a mistake by entering the mobile space with an entry-level product rather than from the high-end side. That risks diluting their brand," said Saadi. The San Diego will be available for £199.99 (US$310) on Orange Pay As You Go, when customers top up £10. That compares to the Apple iPhone 4S with 16GB which costs £489.99 on Orange Pay As You Go. Prepaid users in the U.K. will also receive a free monthly allowance of 250MB of mobile data per month for 12 months. Alternatively, the handset will be free to people who sign a 24 month contract from £15.50 a month before July 25. The package includes 50 minutes, 50 texts, and 100MB of mobile data a month. 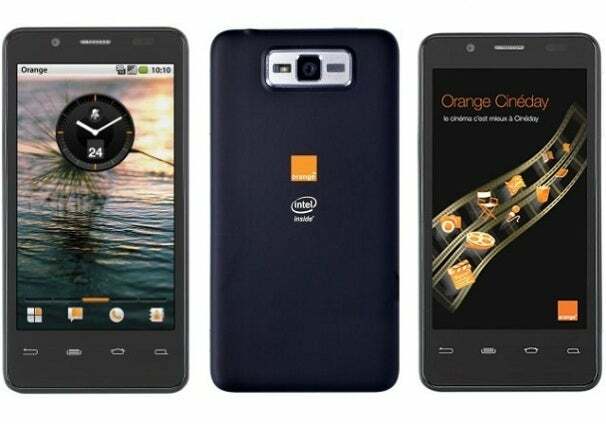 Orange is also planning to launch the phone in France, but an Orange spokeswoman could not provide a date for that introduction. In China, Intel is facing different market dynamics. On Wednesday, the Intel-powered Lenovo LePhone K800 was launched in the country. The phone will cost US$520, which may put it out of reach of most Chinese consumers and limit its success, according to Teck Zhung Wong , senior market analyst with research firm IDC. A version of the phone, called XOLO X900, is also on sale in India.